The Empress of Christmas presides over her festivities adorned in velvety scarlet flowing robes, trimmed in evergreen, rubies, and fur. 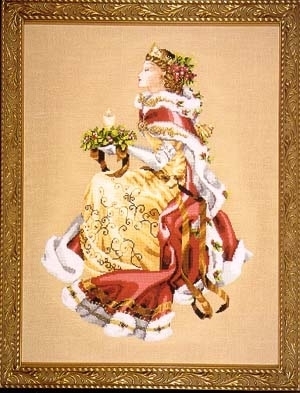 The Baroque gold pattern on her dress changes as the light dances on her gown. Full of glowing splendor, she will grace your holidays as a tradition for years to come. Alternate fabric is 32 count Toasted Almond Linen by Zweigart. Stitched area is 12 3/4" x 18" with a stitch count of 204 x 288. 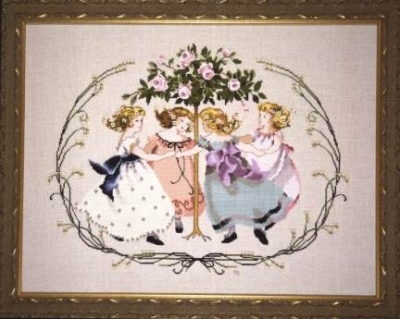 Four carefree girls, hold hands and dance around a blooming rose tree. The girls each have black velvet shoes, flowing Sunday best dresses and flowers adorning each head. 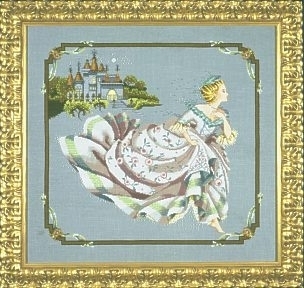 Stitched on 32 count French Lace Linen by Wichelt Imports. Alternate fabric 32 count Belfast Confederate Grey Linen by Zweigart. Stitched area is 16 1/2" x 12 1/2" with a stitch count of 262 x 199. Encircled in a garland of olive branches, this down winged angel reaches out for a dove in flight. She wears a gown of sunset hues and a solid gold halo. We apologize for the error and omission. Stitched on 32 count Natural Light Linen from Wichelt Imports. Alternate fabric 32 count Zweigart Belfast Light Mocha Linen. Stitched area is 12 3/4" x 15" with a stitch count of 201 x 240. 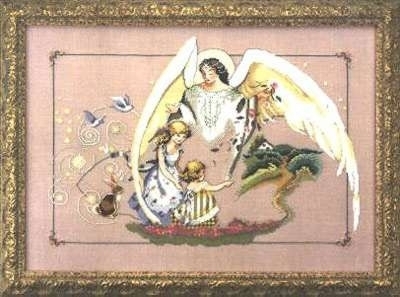 Reminiscent of a favorite painting you remember as a child, Nora’s latest design captures all the love and concern of an Angel watching over two small children. This design will be a treasured part of any home. Stitched on 32 count English Rose Linen from Wichelt Imports. Alternate fabric 32 count Zweigart Belfast Cameo Rose Linen. Stitched area is 19" x 13" with a stitch count of 304 x 206. Floating on the linen with gleaming lock and key attached by a bead chain, this shimmering dreaming beauty is one of Nora’s most romantic mermaids. 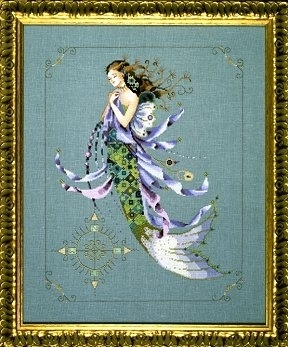 The exquisite scale pattern and airy fins make this a perfect project sure to be admired by young and old. Stitched on 32 count Zweigart Belfast Amsterdam Blue Linen. Alternate fabric 32 count Stoney Point Linen by Wichelt Imports. Stitched area is 12 3/4" x 15 3/4" with a stitch count of 202 x 252. Stitched (2 over 2). DMC floss used. Blends are one strand each. will add a romantic touch to any room. Quiller-Couch, Sir Arthur. The Sleeping Beauty and Other Tales From the Old French. Edmund Dulac, illustrator. New York: Hodder & Stoughton, 1910. Stitched on 32 count Zweigart Smokey Pearl linen. Alternate fabric 32 count Wichelt Twilight Blue Linen. Stitched area is 17" x 15 1/2" with a stitch count of 271 x 246. Stitched (2 over 2). DMC floss used. Blends are one strand each. Third in the series of gardeners is “Winter in My Garden”. Every gardener I know doesn’t rest the minute the snow starts to fall. Winter is a time for organizing seeds, planning beds or researching to find the perfect climbing rose. That’s why our newest design depicts a woman in her greenhouse amidst all her started seedlings, dreaming about spring and the new start it will bring. Stitched on 32 count Natural Linen by Wichelt Imports. Alternate fabric is 32 count Zweigart Belfast Raw Linen. Stitched area is 11 1/2" x 16 1/2" with a stitch count of 180 x 260. Stitched (2 over 2). DMC floss used. 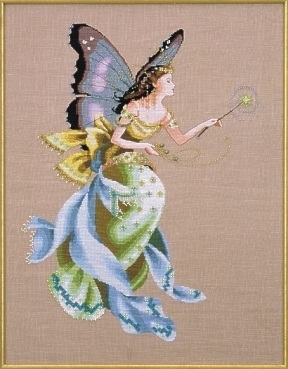 This beautiful fairie with a radiant wand is dressed in shades of pale gold and persimmon pink with fluttering misty blue wings. Entwined with gleaming leaves, she is perched on a mossy branch. 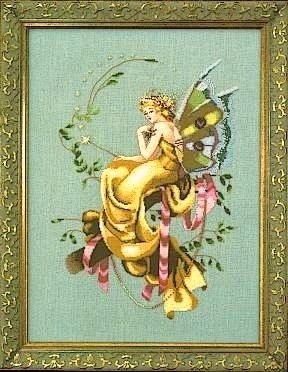 Stitch this magical nymph and imagine flights of fancy. 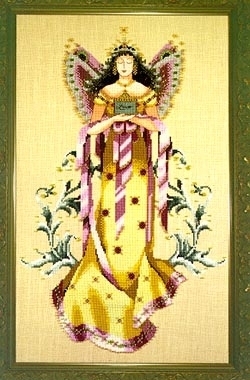 Model stitched on 32 count Stoney Point Linen from Wichelt Imports. Stitched area is 10¾" x 15½" with a stitch count of 170 x 241. Stitched (2 over 2). DMC floss used. A peaceful fairie brings treasures of your own choosing. “Love”, “Joy”, or “Peace” can be inscribed on her special treasure box for a dear friend or you! She is in calm rust and berry colors. Gold beads and satin ribbons cascade from her silken gown and she is enveloped in a mystical garden of pale blues and greens. Model stitched on 32 count Light Mocha Belfast Linen from Zweigart. 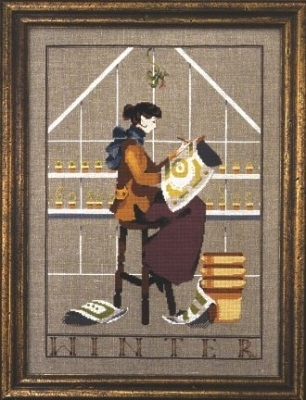 Stitched area is 10½" x 15¾" with a stitch count of 164 x 251. Stitched (2 over 2). DMC floss used. Due to the overwhelming response to “Lady of the Flag”, we have created another pattern that honors our Flag to complete the set. 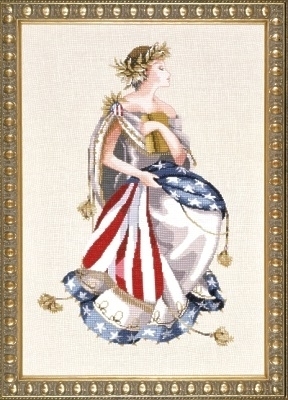 A classic Greek beauty drapes the Stars and Stripes over her lap while she clutches a book of law. She promises peace, justice, and beauty for all. 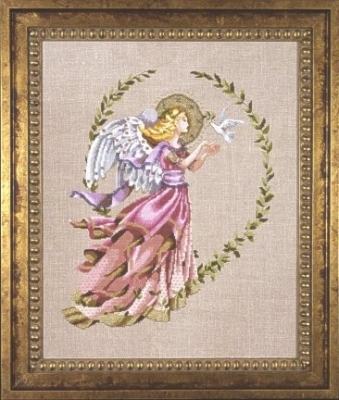 Stitched on 32 count Country French Latte Linen by Wichelt Imports. Alternate fabric is 32 count Belfast Light Mocha Linen by Zweigart. Stitched area is 11 ¼" x 18 ¾" with a stitch count of 181 x 289. Stitched (2 over 2). DMC floss used. Pretty, Pretty, Pretty! In the colors of the cottage garden. -the bodice was formed by sewing together rose petals from the climbing rose her grandmother planted that no one can remember the name of. Oh, and lest we forget the lovely “baby blue eyes” that dot the edges of her wings as well as the edges of her garden paths. 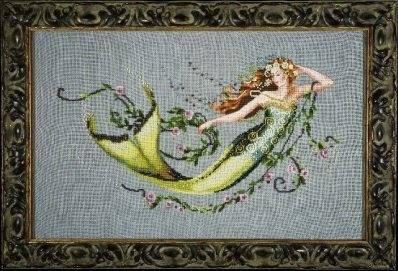 We think she would be lovely paired with her sister “The Queen Mermaid”. Stitched on 32 count Chestnut linen by Wichelt Imports. Alternate fabric is 32 count Belfast Light Mocha linen by Zweigart. Stitched area is 13 1/4" x 17" with a stitch count of 210 x 271.